Veterinary doctors conducted the post mortem of the dead animal after which the its last rites were performed. According to the wildlife activists, there is a good population of gaur in Khanapur taluk of Belagavi district. However the main threat for them here is from road and railway accidents. The Alnavar-Londa-Castlerock and Londa-Miraj Railway lines have became a death trap for these animals. 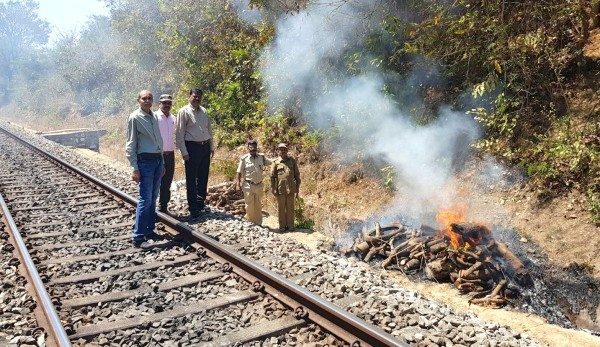 The forest department has made multiple requests Public Works Department (PWD), Karnataka Road Development Corporation Limited (KRDCL) and Railway Department to implement suitable measures for the safety wild animals crossing the roads/ railway tracks both the line departments have failed to implement any mitigation measures. This should not be repeated. Somebody has to be bring it to notice of the Central Ministry.